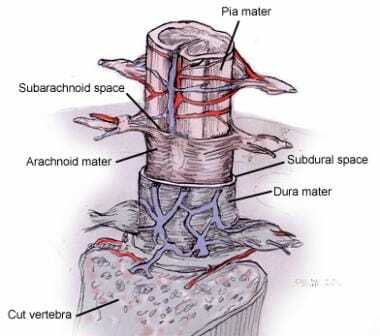 The image below depicts cross-section anatomy of spinal cord. The application of SCS for FBSS is indicated by first excluding the presence of a causative lesion that can be treated surgically or by other nonoperative therapies. Treatment of neuropathic pain symptoms due to FBSS is more likely to respond favorably. [13, 17, 18] In general, these diagnostic entities include radiculopathy or polyradiculopathies due to epidural fibrosis, arachnoiditis, and intrinsic nerve root damage, or radiculitis. The differential diagnosis must exclude transient metabolic processes, such as diabetes, infectious etiologies, entrapment neuropathies, and potential referred or radiating pain often associated with arthropathy (zygapophysial and sacroiliac joints), visceral pathology, or myofascial disorders. Treatable causes of neuropathy must be excluded through appropriate diagnostic evaluation, including blood work, electrodiagnostic studies, and nerve biopsy, if necessary. Numerous patient-characteristics must be scrutinized when evaluating candidates for SCS. Evidence of aberrant opioid-related drug use that suggests abuse or diversion should be considered when patients demonstrate behaviors such as unapproved dose escalation, lost prescriptions, frequent requests for early refills, and obtaining medications from multiple physicians. Disease-specific entities that have demonstrated a high probability of successful pain reduction are most often seen with SCS treatment of chronic neuropathic pain, complex regional pain syndromes, refractory angina pectoris, or painful ischemic disorders. Disease states with a low probability of successful pain reduction that should be avoided include neuropathic pain due to spinal cord injury, central nervous system pain, or nerve root avulsion. Other disorders, such as postherpetic neuralgia, axial low back pain, and phantom limb pain present an unknown probability of pain reduction. Furthermore, countless quality of life issues partner with chronic neuropathic pain. Reduced pain using SCS can prompt pain treatment physicians to eliminate polypharmacy or taper specific medications that cause cognitive dysfunction or blunt mental alertness and to avoid present or future adverse medication-related side effects. SCS may facilitate return to work or other life functions. These are additional influences that are considered when deciding upon whether a trial of SCS is indicated. The most common causes of complications in SCS are lead migration, pain over the implant site, and infection. Over the past 10 years, better techniques in lead anchoring have decreased the incidence of lead migration. To prevent wound infections, patients are typically given perioperative IV antibiotics and can be discharged home on an oral antibiotic, such as Keflex, for one-week duration. The rate of SCS-related infections is approximately 4.5%. Patients with diabetes are at higher risk of SCS-related infection (9%). Infection typically requires hardware explant, followed by IV antibiotics for deep infections or oral antibiotics for superficial infections. Other complications include lead fracture, premature battery failure, and CSF leak from dural puncture. Serious adverse events, such as neurological injury are rare. Persistent radicular pain after lumbosacral surgery can be managed either by reoperation or spinal cord stimulation. North et al. conducted a prospective, randomized clinical study that found SCS more effective in achieving pain control than reoperation as a treatment for persistent radicular pain after lumbosacral spine surgery. The PROCESS study, a multi-center randomized clinical study, compared SCS in combination with conventional medical management in patients with FBSS and predominantly lower extremity radicular symptoms. At 6-month follow-up, 48% of SCS patients achieved the primary outcome of >50% leg pain relief compared to only 9% of the medical management group. At 2-year follow-up, 42 out of 52 patients with SCS had less leg pain and improved functional capacity. Gildenberg PL. History of electrical modulation for chronic pain. Pain Med. 2006. Suppl 1:S7-S13. Rossi U. The history of electrical stimulation of the nervous system for the control of pain. Simpson BA, ed. Electrical stimulation and the relief of pain of pain: pain research and clinical management. New York: Elsevier Science; 2003. 15: 5-16. Melzack R, Wall RD. Pain mechanisms: a new theory. Science. 1965. 150:171-9. Shealy CN, Mortimer JT, Reswick JB. Electrical inhibition of pain by stimulation of the dorsal columns: preliminary clinical report. Anesth Analg. 1967 Jul-Aug. 46(4):489-91. [Medline]. Linderoth B, Foreman Rd. Mechanisms of spinal cord stimulation in painful syndromes: role of animal models. Pain Med. 2006. 7(suppl):s14-26. Fukshansky M, Burton AW. Spinal cords stimulation. Oakley J, Prager J. Spinal cord stimulation. Spine. 2002. 22:2574- 83. Linderoth B, Foreman R. Physiology of spinal cord stimulation: Review and update. Neuromodulation. 1999. 3:137-44. Krames ES. Neuromodulatory devices are part of our "tools of the trade.". Pain Med. 2006. 7:Suppl 1 S3-S5. Vallejo R, Benyamin RM, Kramer J, Bounds D. Spinal cord stimulation. Manchikanti L, Singh V him (eds). Interventional Techniques in Chronic Spinal Pain. Paducah, Kentucky: ASSIP Publishing him; 2007. 655-664. Boswell MV, Trescot AM, Datta S, Schultz DM, Hansen HC, Abdi S. Interventional techniques: evidence-based practice guidelines in the management of chronic spinal pain. Pain Physician. 2007 Jan. 10(1):7-111. [Medline]. Cameron T. The safety and efficacy f spinal cord stimulation for the treatment of chronic pain: a 20-year literature review. J Neurosurg. 2004. 100:254-267. Kreis PG, Fischman SA. Spinal cord stimulation: percutaneous implantation techniques. New York: Oxford University Press; 2009. Lee AW, Pilitsis JG. Spinal cord stimulation: indications and outcomes. Neurosurg Focus. 2002. 58(3):481-96. British pain Society. British Pain Society. Spinal cord stimulation for the management of pain: recommendations for best clinical practice. London: 2005. Mekhail NA, Mathews M, Nageeb F, Guirguis M, Mekhail MN, Cheng J. Retrospective review of 707 cases of spinal cord stimulation: indications and complications. Pain Pract. 2011 Mar-Apr. 11 (2):148-53. [Medline]. Kumar K, Toth C, Nath RK, Laing P. Epidural spinal cord stimulation for treatment of chronic pain--some predictors of success. A 15-year experience. Surg Neurol. 1998 Aug. 50(2):110-20; discussion 120-1. [Medline]. Kumar K, Hunter G, Demeria D. Spinal cord stimulation in treatment of chronic benign pain: challenges in treatment planning and present status, a 22-year experience. Neurosurgery. 2006 Mar. 58(3):481-96; discussion 481-96. [Medline]. Simpson A, Meyerson BA, Linderoth B. Spinal cord and brain stimulation. McMahon SB, Koltzenbburg M, eds. Wall and Melzack’s textbook of pain. 5th ed. Elsevier Churchill Livingstone: Philadelphia; 2006. 569. Fogel GR, Esses SI, Calvillo O. Management of chronic limb pain with spinal cord stimulation. Pain Pract. 2003 Jun. 3(2):144-51. [Medline]. Augustinsson LE. Spinal cord electrical stimulation in severe angina pectoris: surgical technique, intraoperative physiology, complications, and side effects. Pacing Clin Electrophysiol. 1989 Apr. 12(4 Pt 2):693-4. [Medline]. Augustinsson LE. Spinal cord stimulation in peripheral vascular disease and angina pectoris. J Neurosurg Sci. 2003 Mar. 47(1 Suppl 1):37-40. [Medline]. Jacobs Mj, Jorning PJ, Joshi SR, et al. Epidural spinal cord electrical stimulation improves microvascular blood flow in severe limb ischemia. Ann Surg. 1998. 207:179-83. Barolat G. Techniques for subcutaneous peripheral nerve field stimulation for intractable pain. Krames ES, Peckham PH, Rezai, AR, eds. London: Elsevier LTd: Neuromodulation; 2009. 1017. Haque R, Winfree CJ. Spinal nerve root stimulation. Neurosurg Focus. 2006. 21(6):1-7. Alo’ KM, Yland MJ, Redko V, et al. Lumbar and sacral nerve root stimulation (NRS) in the treatment of chronic pain: a novel anatomic approach and neurostimulation technique. Neuromodulation. 1999. 2(1):23-31. Dijkema HE, Weil EH, Mijs PT, Janknegt RA. Neuromodulation of sacral nerves for incontinence and voiding dysfunctions. Clinical results and complications. Eur Urol. 1993. 24(1):72-6. [Medline]. Barolat G. Epidural spinal cord stimulation: anatomical and electrical properties of the intraspinal structures relevant to spinal cord stimulation and clinical correlations. Neuromodulation. 1998. 1:63-71. Stanton-Hicks M. Peripheral nerve stimulation for pain, peripheral neuralgia and Complex Regional Pain Syndrome. Krames ES, Peckham PH, Rezai, AR, eds. Neuromodulation, London: Elsevier Ltd. 2009. 397. Weiner RL, Alo’ KM. Occipital neurostimulation for treatment of intractable headache syndromes. Krames ES, Peckham PH, Rezai, AR, eds. Neuromodulation. London: Elsevier Ltd; 2009. 409. Fénelon G, Goujon C, Gurruchaga JM, Cesaro P, Jarraya B, Palfi S, et al. Spinal cord stimulation for chronic pain improved motor function in a patient with Parkinson's disease. Parkinsonism Relat Disord. 2012 Feb. 18 (2):213-4. [Medline]. Kobayashi R, Kenji S, Taketomi A, Murakami H, Ono K, Otake H. New mode of burst spinal cord stimulation improved mental status as well as motor function in a patient with Parkinson's disease. Parkinsonism Relat Disord. 2018 Jul 6. [Medline]. North RB, Wetzel FT. Spinal cord stimulation for chronic pain of spinal origin: a valuable long-term solution. Spine (Phila Pa 1976). 2002 Nov 15. 27(22):2584-91; discussion 2592. [Medline]. North RB, Shipley J, Prager J, et al. Practice parameters for the use of spinal cord stimulation in the treatment of chronic neuropathic pain. Pain Med. 2007. 8(4):S200-75. Kapural L. Spinal cord stimulation for intractable chronic pain. Curr Pain Headache Rep. 2014 Apr. 18 (4):406. [Medline]. Kinfe TM, Quack F, Wille C, Schu S, Vesper J. Paddle versus cylindrical leads for percutaneous implantation in spinal cord stimulation for failed back surgery syndrome: a single-center trial. J Neurol Surg A Cent Eur Neurosurg. 2014 Nov. 75 (6):467-73. [Medline]. Babu R, Hazzard MA, Huang KT, Ugiliweneza B, Patil CG, Boakye M, et al. Outcomes of percutaneous and paddle lead implantation for spinal cord stimulation: a comparative analysis of complications, reoperation rates, and health-care costs. Neuromodulation. 2013 Sep-Oct. 16 (5):418-26; discussion 426-7. [Medline]. Shamji MF, Westwick HJ, Heary RF. Complications related to the use of spinal cord stimulation for managing persistent postoperative neuropathic pain after lumbar spinal surgery. Neurosurg Focus. 2015 Oct. 39 (4):E15. [Medline]. North RB, Kidd DH, Farrokhi F, Piantadosi SA. Spinal cord stimulation versus repeated lumbosacral spine surgery for chronic pain: a randomized, controlled trial. Neurosurgery. 2005. 56 (1):98-106; discussion 106-7. [Medline]. Kumar K, North R, Taylor R, Sculpher M, Van den Abeele C, et al. Spinal Cord Stimulation vs. Conventional Medical Management: A Prospective, Randomized, Controlled, Multicenter Study of Patients with Failed Back Surgery Syndrome (PROCESS Study). Neuromodulation. 2005 Oct. 8 (4):213-8. [Medline]. Kemler MA, Barendse GA, van Kleef M, de Vet HC, Rijks CP, Furnée CA, et al. Spinal cord stimulation in patients with chronic reflex sympathetic dystrophy. N Engl J Med. 2000 Aug 31. 343 (9):618-24. [Medline]. Geurts JW, Smits H, Kemler MA, Brunner F, Kessels AG, van Kleef M. Spinal cord stimulation for complex regional pain syndrome type I: a prospective cohort study with long-term follow-up. Neuromodulation. 2013 Nov-Dec. 16 (6):523-9; discussion 529. [Medline]. Kumar K, Rizvi S, Bnurs SB. Spinal cord stimulation is effective in management of complex regional pain syndrome I: fact or fiction. Neurosurgery. 2011 Sep. 69 (3):566-78; discussion 5578-80. [Medline]. Pluijms WA, Slangen R, Joosten EA, Kessels AG, Merkies IS, Schaper NC, et al. Electrical spinal cord stimulation in painful diabetic polyneuropathy, a systematic review on treatment efficacy and safety. Eur J Pain. 2011 Sep. 15 (8):783-8. [Medline]. Meglio M, Cioni B, Prezioso A, Talamonti G. Spinal cord stimulation (SCS) in the treatment of postherpetic pain. Acta Neurochir Suppl (Wien). 1989. 46:65-6. [Medline]. Kapural L, Nagem H, Tlucek H, Sessler DI. Spinal cord stimulation for chronic visceral abdominal pain. Pain Med. 2010 Mar. 11 (3):347-55. [Medline]. Kapural L, Cywinski JB, Sparks DA. Spinal cord stimulation for visceral pain from chronic pancreatitis. Neuromodulation. 2011 Sep-Oct. 14 (5):423-6; discussion 426-7. [Medline]. Liem L, Russo M, Huygen FJ, Van Buyten JP, Smet I, Verrills P, et al. One-year outcomes of spinal cord stimulation of the dorsal root ganglion in the treatment of chronic neuropathic pain. Neuromodulation. 2015 Jan. 18 (1):41-8; discussion 48-9. [Medline]. Liem L. Stimulation of the Dorsal Root Ganglion. Prog Neurol Surg. 2015. 29:213-24. [Medline]. Vallejo R, Benyamin RM, Kramer J Bounds D. Spinal cord stimulation. Manchikanti L, Singh V, eds. Interventional techniques in chronic spinal pain. Paducah, Kentucky: ASSIP Publising; 2007. Solomkin JS, Mazuski JE, Baron EJ, Sawyer RG, Nathens AB, DiPiro JT. Guidelines for the selection of anti-infective agents for complicated intra-abdominal infections. Clin Infect Dis. 2003 Oct 15. 37(8):997-1005. [Medline]. Nichols RL. Preventing surgical site infections: a surgeon's perspective. Emerg Infect Dis. 2001 Mar-Apr. 7(2):220-4. [Medline]. Centers for Disease Control and Prevention. Guide for Hand Hygiene in Health-Care Settings. Recommendations of the Health care Infection Control Practices Advisory Committee and the HIPAC?SHEA?APIC?IDSA Hand Hygiene Task Force. MMWR. 2002. 51:1-45. Barolat G. Experience with 509 plate electrodes implanted epidurally from C1 to L1. Stereotact Funct Neurosurg. 1993. 61(2):60-79. [Medline]. Stojanovic MP, Abdi S. Spinal cord stimulation. Pain Physician. 2002 Apr. 5(2):156-66. [Medline]. Feirabend HK, Choufoer H, Ploeger S, Holsheimer J, van Gool JD. Morphometry of human superficial dorsal and dorsolateral column fibres: significance to spinal cord stimulation. Brain. 2002 May. 125(Pt 5):1137-49. [Medline]. North RB, Kidd DH, Petrucci L, Dorsi MJ. Spinal cord stimulation electrode design: a prospective, randomized, controlled trial comparing percutaneous with laminectomy electrodes: part II-clinical outcomes. Neurosurgery. 2005 Nov. 57(5):990-6; discussion 990-6. [Medline]. Farrar JT, Portenoy RK, Berlin JA, Kinman JL, Strom BL. Defining the clinically important difference in pain outcome measures. Pain. 2000 Dec 1. 88(3):287-94. [Medline]. Farrar JT, Young JP Jr, LaMoreaux L, Werth JL, Poole RM. Clinical importance of changes in chronic pain intensity measured on an 11-point numerical pain rating scale. Pain. 2001 Nov. 94(2):149-58. [Medline]. Disclosure: Received salary from Allergan, Inc. for speaking and teaching; Received none from Gralise for consulting.